The present work offers an original approach on the legal notions developed by Hans Kelsen in his attempts towards a “pure” theory of Law, based on a philosophical analysis of the main legal concepts that have a strong philosophical feature, namely those notions which are somehow “shared” between the two fields in their name, but not always in their meaning. While the most striking notion to be approached via a philosophical perspective would probably be that of legal validity (since validity is a central term also in Logic), we aim, in the same way, to approach the notions of legal fictions, the notion of science in Law, normative conflicts or “contradictions” as they are commonly – and wrongly – named, and the rule of inference as it is applied in the context of normative creation, giving place to the wrong notion of practical reasoning. The notion of practical reasoning is very rich in this context of comparison, and will be a special one, as it serves for us to analyze traditional problems of legal theory, such as Jørgensen’s dilemma, as well as it offers the opportunity of providing our own alternative of a legitimate logical treatment of the process of legal justification in the context of the creation of a norm. We aim to analyze the notion of legal and logical conditions as well, which represent a changing in Kelsen’s perspective on the utility and legitimacy of the application of logic to the legal domain. Such a comparative study, even if it appears to be fundamental for clarifying those notions in their respective fields, is a task never before developed in this systematic manner. 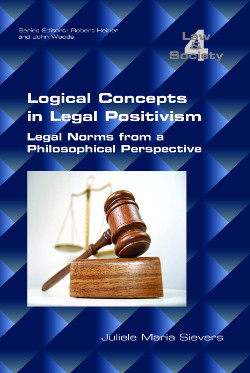 The objective of such a study is to provide a clear overview of the boundaries between the fields of philosophy (especially logic) and the legal norms. A clear understanding of the relations between those “homonym” notions may explain why they are – most of the time – misused when philosophers talk about law, as well as when lawyers and jurists try to justify the concepts composing their legal theories. The context of this study is the legal positivism as it is explained by the legal-philosopher Hans Kelsen. This choice is justified by the fact that Kelsen’s legal theory appears to be the most suitable frame for an analytical, logic-oriented investigation. The work emphasized will be the General Theory of Norms (1979), mainly because of the fact that this book represents how intensively Kelsen dedicated himself to the legal problems mostly related to philosophy or logic, namely the question of the application of logic to norms and the clarification of problematic notions such as the Basic Norm as a fiction or, still, the notion of “modally indifferent substrate”, that we consider to be a path towards a conciliation between logic and law.